Who doesn’t love Christmas decorations? Probably all the poor souls who have to put them up. But from a spectator’s standpoint… Wow! What a lovely sight. A woman by the name of Diana Rowland loves them. Maybe in not the most traditional sense, but the thought is there all the same. Her festive display features dragons instead your standard Santa’s and Baby Jesus’, and it’s rubbed some people up the wrong way. Our dragon holiday display got fan mail! (And apparently the “true meaning of Christmas” involves judgemental bullsh*t?) I’m also not sue I understand how the dragons are only marginally acceptable at Halloween. I guess they think I need MORE dragons?? 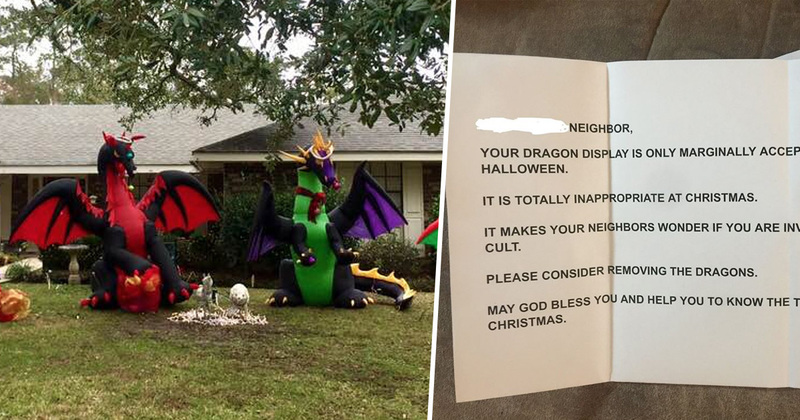 Your dragon display is only marginally acceptable at Halloween. It is totally inappropriate at Christmas. It makes your neighbours wonder if you are involved in a demonic cult. Since then, Diana has received a huge number of donations for her to buy even more dragons. Hi, everyone! I’ve been getting a number of messages about donations or GoFundMes for MORE DRAGONS, and as much as I’m tempted to fill my entire yard with ALL THE DRAGONS, I believe that the Christmas season should be about joy and charity. Therefore, I would much rather people take the money they might put toward my dragon army and donate it to a worthy organisation, such as a local food bank or shelter, or programs for underprivileged kids, etc. Therefore, in the name of MY DRAGON ARMY, I invite you all to leave a link in the comments to your preferred charity. Or, if you don’t have a fave charity, please feel free to leave a gif or video that always makes you smile and brings you joy. Keep doing you, Diana. And Merry Christmas.